We assume you wouldn’t have much to say if you were asked about your current office chair. It’s most probably comfortable and sturdy, so there’s likely nothing more you’d wish it could provide. You, however, are likely to replace it with the boss’ chair if you could. Your office chair most probably pales in comparison to this office chair’s state-of-the-art design and wide array of features. But you likely assume such office chairs cost an arm and leg, so you settle for your ordinary office chair. You no longer have to do so. Enterprising companies like LexMod are now offering consumers innovative office chairs at reasonable prices. For proof, we present you the LexMod Edge Office Chair. Currently available through Amazon with free shipping, the LexMod Edge Office Chair is less than half the price of most other state-of-the-art office chairs currently available in the market. But, we assure you: Not only is it well designed; it comes with a surprisingly wide array of features. At first blush, the office chair appears to be just another ordinary office chair. It consists of back support, leatherette cushion, two arm rests, and five wheels. Virtually all office chairs have these parts. You’re right if you’d say so, too. But once you take a close look at it, you’ll see there’s much more to it. First: It’s made of sturdy materials: iron, plywood, PP, nylon, and polyester fiber mesh. Thus, it could withstand a lot of wear and tear without falling apart. 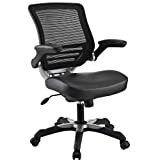 Second: its mesh back support, thick sponge seat, built-in ergonomic lumber support on the back, and easy height, seat, tilt, and tension adjustment provides superior comfort. Thus, it lets you sit and work comfortably even for a long period of time; thereby helping you be even more productive. Third: its mesh back support lets as much air as possible circulate around you while you’re seated. Not only does this help prevent you from sweating, but it also dries out your sweat fast; thereby making sitting on it even more comfortable. The rest of the useful features of the office chair are: easy assembly, flip-up arms that make it even more comfortable to sit in, overall dimensions of 24″ x 26.5″ x 38–42″, which ensures it won’t take up more space than you’d like to make for it; and modern minimalist look, which makes it a functional piece of art that could give you an air of style while you work and thereby make work an enjoyable experience for you. While the seat cushion is thick, according to some consumers, it’s too thin for comfort. As such, it may force you to buy a pillow or several pillows to be comfortable in the office chair itself. Another drawback to it that other consumers have pointed out is the leatherette cover’s being made of substandard materials. It’s too soft for comfort and thus tears easily, according to them, which could force you to use the office chair itself more carefully than necessary. It, however, has received a commendable rating of 4 stars out of 5 on Amazon. Surely this is a comfortable chair suited for its price. Given this review of the LexMod Edge Office Chair, we hope to have proven to you that comfort, sturdy construction, and style need not always come at a high price. Indeed, using this office chair will make you feel like a boss without burning a hole through your wallet. But don’t just take our word for it. Prove it for yourself. We assure you: You won’t be disappointed.